Although Julia Child was not French, she became the expert in French cuisine and America’s sweetheart of the kitchen. Last year when the movie Julie & Julia was released, the world fell in love with Julia Child all over again. And, thanks to the movie, the world discovered a side of Julia Child that most of us had never known. Julia was not only a master chef, but she was a passionate wife, a shrewd business woman, and a matter-a-fact, no-nonsense teacher. Not having grown up with Julia on television, I’ve never really been that interested in Julia Child. And, admittedly, I’ve never been interested in the Mastering the Art of French Cooking. However, after seeing the movie, I became more and more intrigued about Julia’s life, her marriage, and her path to becoming a world-renowned chef and television personality. 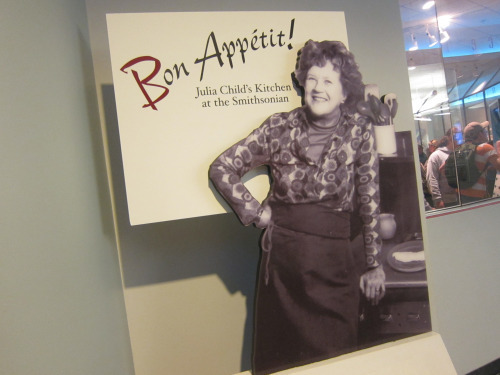 Just like Amy Adams character in Julie & Julia, I too made a pilgrimage to the Smithsonian to see Julia’s kitchen. I was a little underwhelmed at the exhibit but mesmerized at the same time. 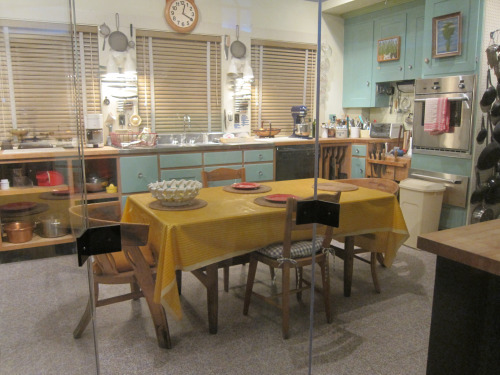 The exhibit itself is not very large – her kitchen was not very large. But what struck me the most was how “normal” her kitchen was. Sure, she had more knives and copper pots and pans than most people will have in a lifetime, but her entire kitchen was very plain, and rather counter-cluttered. It reminded me of my grandmother’s kitchen. Her appliances, serving ware, and wall decor were simple, very unextraordinary by today’s “top chef” standards. And her refrigerator was even covered with the same clutter that most of us have on our own fridges – pictures, magnets, etc. But, even in all of it’s plainness, it seems that Julia Child’s kitchen is symbolic of her life – simple and down-to-earth, yet full of energy, passion, and, most of all, a love for food. thanks… i love to know more about her..